Last weekend Bob and I were out to dinner with two Amish couples that are dear friends of ours.We went to a popular Lancaster County buffet. This buffet is patronized by tourists as well as Amish as they actually chose the restaurant that evening. I was sitting with the women as we waited for them to take us to our seats when a woman came up to us and asked if she could take their picture. Not mine, just theirs. In fact, she wanted me to move a little to the side. The men were standing farther away and not privy to the question. Neither woman answered so I spoke up and politely said that they didn’t really like to have their photos taken. The woman explained that she was from New York City (enough said) and it has taken her 10 years to get her husband to bring her down to Lancaster and she just wanted one photo of them. As I was about to explain “no” to her again my Amish friend said “yes” to the photo. I was a little surprised. She then said that they would not pose for the photo but would continue talking amongst ourselves and if she happened to take the photo then they would not mind. So, we went back to talking and the woman took the photo and thanked us and left. 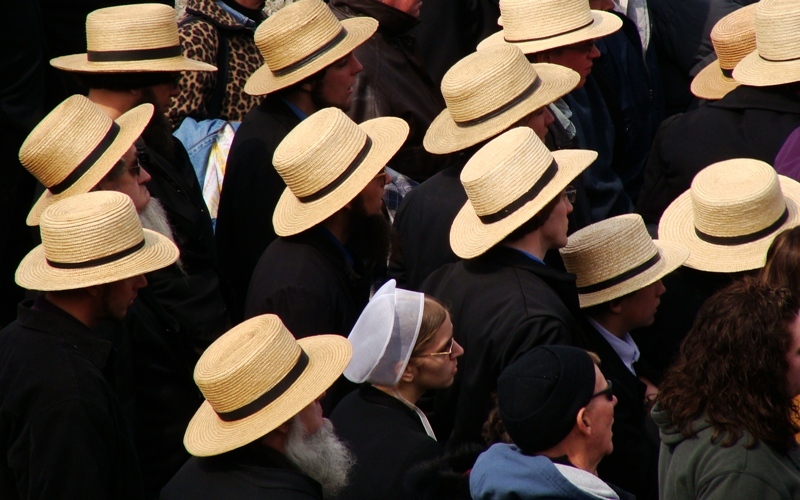 Having taken a few Amish photos of my own of a farmer in the field or at the auctions or an Amishman trying to coax a horse over a bridge I took this opportunity to ask the question: How do the Old order Amish feel about photos being taken of them? The women obviously had no real problem with it as they allowed the photo to be taken. The one woman said that she has grown up in Lancaster County and they are used to having their photo taken. They won’t pose as that would be improper but clearly the taking of the photo was not a big issue for her. the other woman agreed. She said that she traveled out west one time and went to a big ranch and she wished she had a camera because she wanted to take pictures to show everyone at home what all the cowboys looked like. She said that is how people must feel about them. The men said they felt the same way. I asked the men what they thought about people taking photos of them out in their buggies or in the fields. The one Amish farmer said that his dad taught him just to smile and wave if someone took his photo. The other gentlemen is in the commercial building business said that he doesn’t really pay it any attention and doesn’t notice most of the time. He said that perhaps in areas less commercial or less populated that the Old Order Amish may feel more intruded upon but that here in Lancaster County – they are very used to it. As our meal ended we noticed that the woman who took the photo was seated at the table behind us. My friend got up to talk to her and they laughed and shook hands before we left. She chuckled to herself and said “I went up to her and asked if I could take her picture next time”. I know that the Amish are often as seen as insular and stoic but I have found many of them to be very outgoing and most of them have a wonderful sense of humor. Our friends are both.